Shortly after the sporty Corvette went on sale, tuners got their hands on it and began modifying it for racing. Bill Thomas was one of those tuners and he began his career in 1956. GM was impressed and paid him to help with the Corvair and Chevy II. Thomas also opened Bill Thomas Race Cars in 1960 in Southern California. When Ford partnered with Shelby, General Motors felt a little left out and went to Thomas to see what could be done about it. Thing was, GM had a ban on factory racing so they had to support the program covertly. So Bill Thomas and Don Edmunds designed the Cheetah. Chevrolet supplied the 400+ horsepower 5.5-liter V-8 and a bunch of other parts. The first two cars were bodied in aluminium by California Metal Shaping. After GM gave the thumbs up, the rest of the cars were fiberglass, done by Contemporary Fiberglass. GM wanted 100 cars to homologate it for FIA competition but they cancelled their support after only 11 cars were made between 1963 and 1965. This is the fourth fiberglass Cheetah built. It was one of three purchased by Alan Green Chevrolet in Seattle and the only one of those to see action on the track, competing in the SCCA. A subsequent owner converted it for street use, which included stamping his own serial number on the chassis and replacing the body. In 2012, the original body was put back on the car. There were extra chassis and bodies completed, but only 11 actual cars were ever built, turn-key, by the factory. These are legendary American performance machines that are much rarer than Shelby’s counterpart (and also like the Cobra, originals are way outnumbered by replicas). They rarely change hands and this fully restored example should bring between $300,000-$500,000. Click here for more info and here for more from this sale. 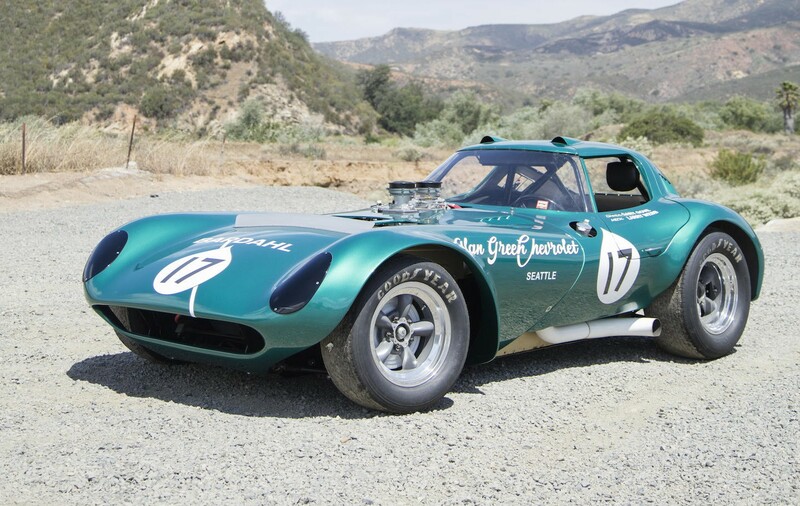 This entry was posted in Uncategorized and tagged 1964, auctions, Bonhams, cars, cheetah, classic cars, coupe, gt, race cars by classiccarweekly. Bookmark the permalink.